As we approach a fresh, new year, isn’t it time you started thinking about ways to revamp your conference events? Shaking up your session formats will not only get people’s attention, but it will also encourage new ways of engaging, learning, collaborating and networking at your event. Here are 20 ideas to reinvigorate your conference in 2018. Campfire Sessions begin a lot like a traditional presentation, with a speaker (or multiple speakers) at the front of the room presenting an idea to a group of people. After 15 or 20 minutes, however, the focus shifts from the presenter to the audience. For the remainder of the session, the presenter becomes a facilitator, inviting comments, insights and questions from those around the room. Campfire sessions allow attendees to drive their own learning and share experiences with others, which also assists with networking. Birds of a Feather (BOF) involves groups of people with a common interest or area of expertise informally working together. It’s often done over lunch or during the morning coffee break. The event organiser can suggest BOF groups for delegates to join but participants can also create their own. The names go on lists and when it’s time for a session the lists are handed to one of the group members to gather their people together. The sessions take place without a pre-planned agenda and are designed to encourage discussion and networking. Despite the fancy name, this format essentially involves voting with your feet. The presenter asks the group a small number of key questions (usually no more than 3 or 4 as participants might get tired!) and individuals move to an area of the room to indicate their answer. Highly visual, this technique can be used to quickly and enjoyably explore all kinds of useful information about a group. It makes an ideal icebreaker at the start of a session and can be repeated at the end to measure shifts in opinion. Typically lasting between 90-120 minutes and able to handle hundreds of participants, The Solution Room is designed to provide peer-supported advice on individuals’ most pressing problems. Each participant is given time to think of a challenge they are facing. A human spectrogram can be carried out to demonstrate how difficult people feel their challenges are to overcome. Another can be done to show the years of experience participants in the room have to offer each other. Participants are then divided into groups of 6-8 and each person takes it in turns to present their problem and have it brainstormed by the group in 7-minute cycles. Groups share round tables with paper cloths that they can write on. A final spectrogram maps the shift in the way participants now feel about their respective challenges. 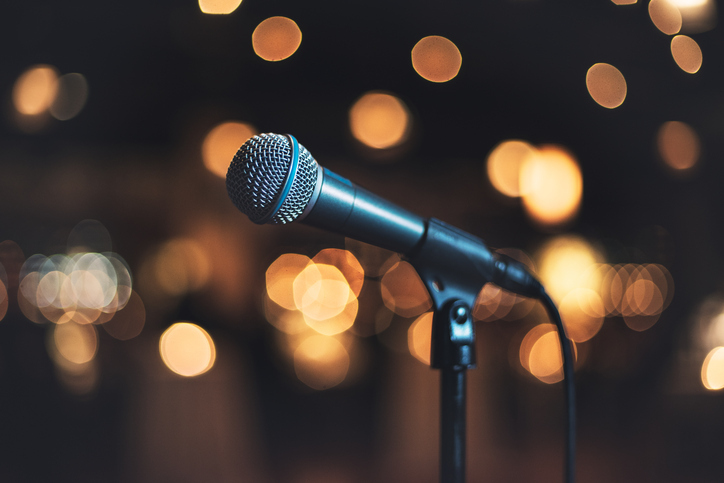 As the name suggests, lightning talks give speakers a limited amount of time to make their presentation – no more than 10 minutes. They may or may not include slides, but if they do, the slides usually move forward automatically to keep speakers to time. Because lightning talks are brief, it requires the speaker to make their point clearly and rid the presentation of non-critical information. This, in turn, helps keep the attention of the audience. It also means many ideas can be presented in a short amount of time. A period of between 30 to 60 minutes is usually allotted to lightning talks, allowing for up to 12 speakers to be heard. A form of “lightning talk”, Ignite Sessions give speakers five minutes to talk on a subject accompanied by 20 slides. Each slide appears for 15 seconds and is automatically advanced. The speaker must not read the details included in the slides. Also falling in the “lightning talks” category, PechaKucha 20×20 is a simple presentation format where you show 20 images, each for 20 seconds. The images advance automatically and speakers talk along to the images. This format allows multiple speakers to speak at once within the same room, while delegates can choose who they want to listen to. Participants wear wireless headphones with various channels, which they can switch between in order to tune into different speakers. Delegates are able to enjoy bite-size pieces of information and can ensure they’re always listening to something that interests them. Speakers should wear sound blockers to avoid being distracted by other speakers and participants should be encouraged to embrace the silent experience, only showing their appreciation through silent clapping etc. The World Café format is a simple, effective, and flexible format for hosting large group dialogue. The process begins with the first of two or more rounds of discussion for groups of 4-6 seated around a table. Each round is prefaced with a question. At the end of each 15-20-minute round, each member of the group moves to a different table. They may or may not choose to leave one person as the “table host” for the next round, who welcomes the next group and briefly fills them in on what happened in the previous round. Once all rounds have been completed, key points from each table are presented to the whole group for a final collective discussion. Fishbowls help facilitate discussion in large groups by having just 3-6 people talk at any one time. Those individuals are seated in the centre of the room while the while the rest of the participants (maximum of 50 people) sit around the outside and observe without interrupting. You can have “closed” or “open” fishbowls, meaning that the discussion is either exclusive to the selected participants or one or more of the chairs is open to members of the audience who want to ask questions or make comments. Although largely self-organising once the discussion gets underway, the fishbowl process usually has a facilitator or moderator. A Samoan circle is similar to a fishbowl in that active participants sit surrounded by listeners. It is a leaderless format, whereby anyone who wants to talk may step forward to enter the inner circle. They can enter the inner circle at any time, including to stop somebody else from talking. Participants must retire when prompted. The format is ideal for making sure many viewpoints get heard, however clear topics of discussion are needed to ensure conversation does not dry up. A jigsaw session is a cooperative learning technique where a larger group is divided into groups of 5 or 6 (jigsaw groups). The learning to be delivered during the session is also divided into 5-6 segments. Each participant in a group is assigned to learn one segment, with the help of an external instructor. All the participants assigned to the same segment form temporary “expert groups” and are given time to discuss their learnings and rehearse the presentations they will make to their jigsaw groups. Once back in their jigsaw groups, each member presents their segment to the others. The instructors can float from group to group to ensure the learning is being delivered correctly. At the end of the session, a quiz can be given to test overall knowledge of the material. Including a soapbox at your event can provide delegates with a platform to have their ideas heard. Individuals can submit proposals to participate and, if they are chosen, will be given a short time on stage to present an issue that is important to them. Challenging views are encouraged, as well as the sharing of any projects or pieces of research likely to be of interest to the audience. The format is informal and sessions are usually limited to 30 minutes in total. This format takes a central theme or question and has two speakers debate for and against. At the outset, the participants are polled to measure their opinion on the topic. Following the debate, they are polled again to see how many are now in favour or against. The winner of the debate is the speaker who caused the most audience members to change their votes. The talent show format is ideal for presenting projects, demonstrating technology or pitching ideas. Participants have 3-5 minutes to demo their concepts and, ideally, this is done visually with props to create a “show”. Between 5-7 “acts” perform before the audience is asked to vote on their favourite. A presenter helps to introduce the acts and keep the audience engaged. This format is designed for larger conferences with pan-European attendance, helping to connect delegates to the host country or city and provide a different point of view. Attendees are taken outside of the conference venue to a non-convention centre setting where they hear from a local speaker. Inject some fun into proceedings by quizzing teams of speakers, Family Fortunes-style, to see how well they understand the audience. The quiz is prefaced by an audience poll where they vote on answers to a selection of questions. Next, the speakers are asked to guess the top answers e.g. “What do delegates think is the biggest challenge facing the ABC industry right now?”. Whether they get it right or wrong, it’s a novel way to deliver the results of the poll to the delegates. Personal introspective is a session where attendees privately reflect on their answers to five questions. All attendees write their answers down. They then have an opportunity, but not an obligation, to share their answers with the group. It is a useful format to use towards the end of the event to help reinforce learning and solidify commitments to make changes based on their experiences at the event. Storytelling sessions invite speakers to tell stories that help illustrate or enhance themes in the conference tracks. They should reflect the authentic experience of an individual, a team, or a community, but be told like a traditional story. The narrative should contain a beginning, middle and end, characters and themes that hold interest, like adversity and triumph. Stories should be about 15 minutes long, with 10 minutes provided for Q&A afterwards. Braindates help delegates learn from one another through one-on-one or small group sessions (otherwise known as “dates”). Participants make offers and requests for knowledge on topics of interest and are then matched together (this can be done manually or via an app). Matched individuals can then schedule meetings with one another, aiding both learning and networking. There are so many different ways to shake up your conference programme so don’t stick with the same old, same old. Try one of the above formats, or create your own. For more inspiration, check out our Executive’s Guide to Creating an Out of This World Conference!